Alev Karagulle of Burgess confirms to me that one of the world's largest sailing yachts, Perini Navi's 88m Maltese Falcon has been sold - yet another milestone in the company's history of selling very large yachts and the most significant sale since the start of the credit crunch. According to Burgess CEO Jonathan Beckett, the sale was concluded following a one year process for close to the asking price, with Burgess representing both buyer and seller. The new owner was apparently not merely attracted to the yacht's cutting edge technology in its own right, but to her green credentials that result from an ease of operating functionality, rendering her one of the most environmentally advanced superyachts afloat today. "Aesthetics, technology and sustainability were all very key factors for the buyer and Maltese Falcon ticked all the boxes." explains Jonathan. 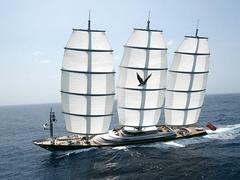 Her asking price was €70 million and the joint listing agent was Bruce Brakenhoff of Perini Navi USA.